​Juliette offers a monthly column as a means for us to Reconnect with the Natural World. By cultivating our ability to perceive personal supports available to us all and deepen a reciprocal relationship with our home planet, we bring reverence, healing, and a deeper experience of living into our awareness. Basmati’s mission is to use the power of technology to help every human being live a healthier life by: sharing ancient and modern wisdom, connecting readers with practitioners, and curating eco-friendly products. Marji invited Juliette to become a contributor of articles and audio recorded conversations with the aim to further support wellbeing and mental health via personal spiritual practices and balancing our nervous systems. Sibyl English reached out to Juliette with the invitation to write 12 articles offering wisdom for the spirit and soul of women. In each issue, Juliette shares practices and experiences to do at home for women to deepen their personal connection to the natural world, to Spirit, and to their authentic selves. Damien Gendron and Juliette Woods discuss the importance of ceremony and community in our modern lives, the shift towards greater support between masculine and feminine ways of being, and how we can respond to the political climate south of the border. Sandra Goodridge featured Juliette as her guest artist, showing a number of her shamanic paintings and ceremonial photography during the month of May. Here is an excerpt "... paintings full of symbols and markings etched into the paint around whimsical animals, mushrooms, and landscapes, or as intricate colour-filled mandalas that hold specific medicinal intentions for the viewer’s well-being." 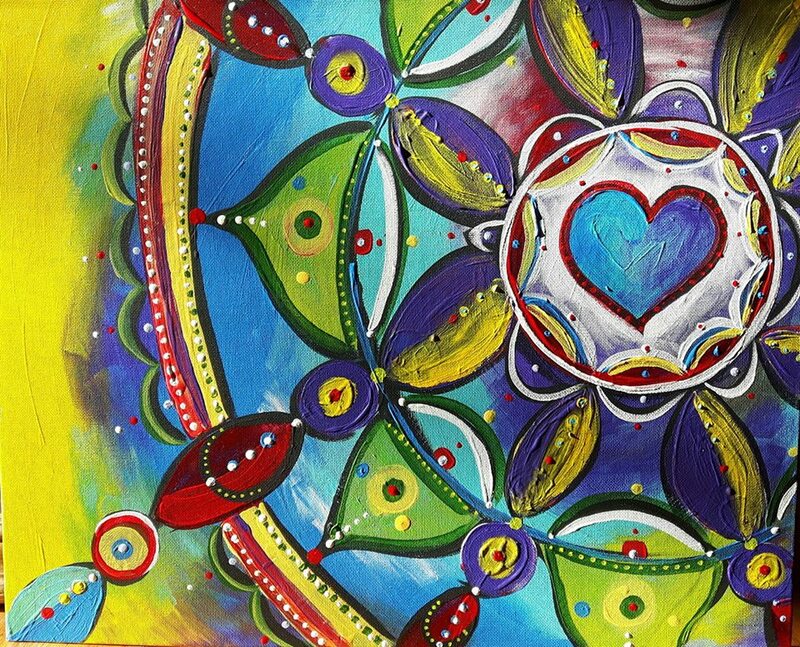 "International Women's Day Art Show"
Juliette was invited to share a little about channeling spirit through her paintings in an article bringing awareness to the IWDAS in Squamish BC. It was beautiful to see she wasn't the only artist to mention how her shamanic practice influences her art! David Buzzard from the Squamish Chief surprised us with a half page commemorating our Winter Solstice fire ceremony and water blessing in the December 22 edition. The event also included a potluck, shaman’s market, storytelling, card readings and meditation. 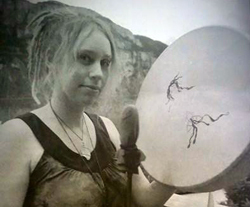 "Cultivating a Shamanic Lifestyle with Juliette Woods"
Tammra Broughton interviewed Juliette about the call to deeper living, the desire to connect to the natural world, and how shamanism can support answering this call. "10 ways to make Ordinary Moments feel Sacred"
Gagan contacted Juliette during an investigative article on various holisitc healing modalities for insights into shamanic healing services, and how it differs from and supports, western medicine. "The Goddess Experience Weekend Retreat"
Retreat presenters were introduced via video shorts and spoke about the workshops being presented. 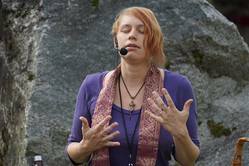 Juliette hosted a fire ceremony and embodied dance event at The Goddess Experience in beautiful Agassiz BC. "Finlandia Pharmacy Brain State Conditioning"
Citrus Pie interviewed Juliette about the details of the neurofeedback program at Finlandia's Brain Health Clinic, including footage of a brainwave balancing session and interpretation of brain waves. "Brain State - Stress Relief"
Juliette was interviewed by Beth Lahti, a contributing author to True Blue Spirit, regarding her personal experiences with Neurofeedback in this spiritual & conscious living publication. 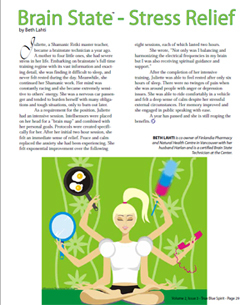 Juliette contributed articles that bring together healthy living and natural medicine with a non-denominational spiritual flavour. "Brain Training Promoted as Mental Elixir"
Canada's largest urban weekly newspaper interviewed Juliette while working as a Neurofeedback Technician in Finlandia's Brain Health Clinic to contribute her professional and personal experiences. Juliette was a contributing author in a collection of experiences about the transforming powers of this ancient healing art. Conceptualized and published by Tania Bakas and Tracy Lydiatt, who compiled these lovely, personal submissions of how Reiki can change lives.